There’s action from Crablands, Fittleworth and Arun in our latest round-up of the local indoor bowls scene. Crablands Avocets almost squeezed a point from their home game against Norfolk Cubs. After being 14-5 down, Avocets Sheila Plaistow, Harry Stead, Trevor Plaistow and skip Bill Merritt bravely fought back to take 13 shots on the next 11 ends and needed only one more on the final end to draw with Norfolk’s Mervyn Warren, Peter Jennings, Keith Holden and skip Mike Starns. Unfortunately for Avocets, the umpire declared a tied final end and Norfolk took the game 18-17. The other league mat was nip and tuck all the way with a scoreline 15-15 on the 16th end. 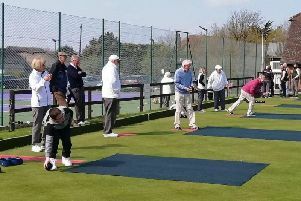 However, despite consistent good play by Avocets’ skip, Peter Latchford, they dropped a four and a three on the remaining ends and, although working hard, Peter’s team of Sylvia Gray, Joan Taylor and Elaine Sadler could not recover. Some devastating play from Norfolk’s Ray Shrubb and his team of Peter Slade, John Cordery and Ernie Cole took the last shot of the game, winning 23-17. On the friendly mat Mollie Back, Celia Foot, Eddie Wilcox and skip Alan Foot looked certain winners halfway through the game leading 11-4. But perseverance from Norfolk pulled them back, Avocets winning 14-13. Crablands Cormorants hosted Nyetimber Bears and enjoyed a 43-31 win to take all six league points. Scores: Joyce Abel, Jan Obermayer, Mollie Back and Martin Hunt (capt) won 16-15; Denise Merritt, Marion Hatch, Reg Hatch and Joyce Heritage won 27-16; Sylvia Gray, Eddie Willcocks, Rod Shambrook and Terry Axworthy lost 33-17. The annual gentlemen v ladies competition for the John Kingsley President’s Cup was won by the gens, who won on all three mats. Fittleworth took six points in their league home match against Crablands Bitterns. Scores: Jane Adsett, Gina Barnfield, David Luxford, Bernard Adsett won 30-19; Audrey Hodgson, Monica Enticknap, Charlie Martin, Sue Judd won 24-13; (friendly mat): Pauline Gilpin, Arthur Ellcome, Marc Wood, Alvar Etherington won 33-10. On a visit to Wealden IBC, Arun ladies lost by 30 shots. Scores: J Foster, C Dunham, M Bacon, D Latter lost 24-10: D Mitchell, C Preston, S Stocker, J Whetstone lost 21-19: V Greenaway, JC Taylor, W Bury, J Taffurelli won 19-18: D Hogg, B Arnell, J Adams, M Phillips lost 21-16: K Burnard, P Rampton, C Mayoss, G Conley lost 22-11: E Keywood, M Potter, W Adams, M Richards won 16-15. In the first match for the Osborne Trophy, Arun ladies lost to the men by 46 shots – which they hope to recover over the next two rounds. Scores: V Greenaway, S Stocker, G Conley, C Horsley lost 20-11; P Terry, J Adams, B Collins, A Janman won 19-11; I Brooker, M Bacon, J Taffurelli, D Latter lost 34-9, J Boucher, E Cooke, W Adams, S Miles lost 32-10, C Hobbs, S Hart, M Phillips, B Spicer lost 20-16, E Fitch, F Ireland, S Judd, M Richards won 21-15. In the latest round of the Masons Trophy, a national event played on a one-team-home-one-team-away basis, the ladies played Palmerston and won 48-31. Scores: Home: C Hobbs, B Collins, B Spicer, A Janman won 29-12; Away: E Fitch, J Taffurelli, S Judd, M Richards drew 19-19.